Figure-accentuating long sleeved shirt made from a supple cotton-modal-elastane blend with patterns that tell stories like those from Arabian Nights. The feminine top of cosy jersey is an enchanting favourite piece for everyday for every "Blutsschwester"! The pretty V-neck with draped knot detail on the breast functions as a special eye-catcher and ravishing décolleté flatterer. A dividing seam under the breast provides for the right seat of the shirt and a universal fit. A small pendant made of aged gold-coloured metal makes a textile promise: The small infinity symbol near the hem forecasts that it is love forever! 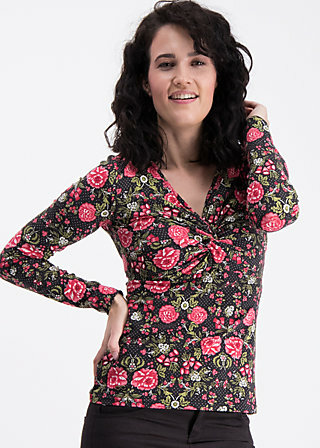 The fabric “hungarian-roses” can be easily combined with those fabrics.